MANILA, Philippines, December 7, 2014 (ENS) – Super Typhoon Hagupit, known locally as Ruby, is expected to hit Metro Manila starting Monday evening. Packing sustained winds of more than 200 kilometers per hour (124 mph), equal to a Category 3 hurricane, Rudy is forecast to peak in the nation’s capital at around 8 to 10 pm, according to PAGASA, the Philippine national weather agency. 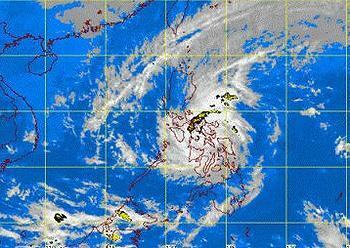 Public storm warning signal number 2 was raised over Metro Manila Sunday night, PAGASA said. Disaster relief authorities estimate the storm could possibly affect more than 30 million people. Hagupit has claimed three lives as it screamed across the central Philippines Sunday, taking out houses, trees and power lines in areas still damaged from Super Typhoon Haiyan that killed thousands of people in November 2013. More than one million people have been evacuated to shelters far from coastal areas and villages in the path of potential landslides by the time Hagupit made landfall Saturday night, in what a UN agency said was one of the world’s biggest peacetime evacuations. The storm made first landfall in the island nation in the Eastern Visayas on Saturday afternoon, much later than expected, with strong winds, high storm surge and moderate to heavy rainfall within its 450 km (280 mile) diameter. Slow-moving super typhoon Hagupit is tracking northwestward. Ruby and the northeast monsoon together are causing rough to very rough sea conditions along the coasts of Luzon and Visayas islands and over the northern coast of Mindanao. Storm surges are reaching up to three to four meters (10 to 13 feet) inland. “Fisherfolks and those using small sea craft are advised not to venture out over the said seaboards,” warns the Philippines National Disaster Risk Reduction and Management Council. Forecasters say the amount of rain a typhoon lets loose depends on how slowly it moves. Ruby is moving along very slowly, at about five knots, over an area of rough, steep terrain, triggering landslides, debris flows, and life-threatening flash floods. On the eastern island of Samar, Catbalogan City, with a population of 94,317, was hit on Saturday with some 365 millimeters (14.4 inches) of rain within 24 hours. Rainfall at Borongan measured 355.6 mm (14 inches), isolating the city as roads and communication lines were damaged by the storm. The super typhoon is not forecast to leave the Philippines until Thursday morning. President Benigno S. Aquino III on Thursday presided over a National Disaster Risk Reduction and Management Council meeting in Camp Aquinaldo to coordinate government efforts to mitigate the impact of Typhoon Ruby – evacuating people and putting up emergency facilities as well as prepositioning food and non-food items, before the typhoon hits land. The Department of Social Welfare and Development said 100,000 family food packs are available at its central warehouse, ready to be airliftedto assist victims in the 50 provinces that could be affected. The military said two C-130s and several helicopters are ready to transport relief and personnel. Its engineering battalions are on standby and ready to move in for clearing operations and repair of major facilities. By Sunday morning, clearing had started in Borongan so that relief goods can be transported in. The military said it will submit to the President a plan detailing its proposed response to prevent looting incidents, such as what happened in the aftermath of Typhoon Haiyan last year. The United Nations World Food Programme said today that it is “working flat-out” to support the Philippines government’s humanitarian response to Typhoon Hagupit, which could possibly impact more than 30 million people. “Food, trucks or satphones [satellite phones] – we will provide whatever is needed to help the people of the Philippines as this situation unfolds,” said Praveen Agrawal, WFP Philippines Country Director. Supplies are being readied for deployment to Eastern Visayas and Bicol regions to rapidly assist in the immediate aftermath of Ruby. WFP says it has its own food stocks in-country if government supplies need to be supplemented. This includes more than 260 metric tons of high energy biscuits, almost 4,000 MT of rice, and over 130 MT of ready-to-use supplementary food. These food stocks could provide assistance to about 1.8 million people for a two-week period. Delivery of government supplies of food to affected communities as quickly as possible entails temporary warehousing space and land and sea transport, as well as information technology support such as radios, satellite phones and generator sets. Meanwhile, the UN Humanitarian Country Team said today that shelter and protection issues concerning women and children will be a priority in the immediate aftermath of the typhoon. Moving people to higher ground is a priority to ensure lives are saved and the Philippine government has taken preventative steps by evacuating more than 600,000 people in the past 24 hours alone.